These roasted pumpkin dip recipes are for those who like their dips a little spicy. Let's face it, on its own pumpkin can be a little bland, and needs a kicker to add more taste. Roasting is one way to add flavor. By drizzling over a little olive oil and baking in the oven, the pumpkin develops a caramelized flavor. Throw in some spices, chili or peanut butter and you transform ordinary pumpkin into a taste explosion. Peel, deseed and coarsely chop pumpkin. Drizzle the pumpkin with half the olive oil and place on a baking tray. Bake in the oven for 35 - 40 minutes or until soft and well caramelized. Heat oil in a medium frying pan over a medium heat. Add cumin and garlic and saute for about a minute, stirring constantly. Add the pumpkin and toss until coated with the spice mixture. Remove from the heat. 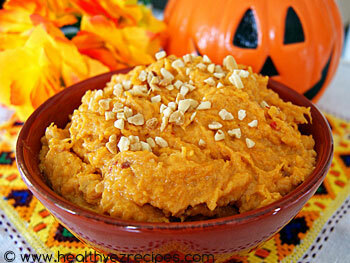 Place the pumpkin mixture and yogurt in the bowl of a food processor and process until smooth. Season to taste. Stir in the chopped coriander. Transfer to a bowl and cover with plastic wrap then chill in the refrigerator for about an hour. This not only chills the dip but also allows time for all those lovely flavors to develop. Serve with turkish bread or crackers. Preheat oven to 190°C / 375°F. Cut the pumpkin in half and scoop out the seeds, leaving the skin on, and place on a baking tray. Brush the top of the pumpkin with a little olive oil. Bake for 35 - 40 minutes or until the pumpkin is soft and cooked through. The cooking time will depend on the size of your pumpkin. Remove from oven and allow to cool slightly. Scoop out the pumpkin flesh and place into the bowl of a food processor with the cumin and the remaining tablespoon of oil and process until smooth. Add the peanut butter and chopped chilli and stir through until thoroughly combined. Meanwhile place 2 tablespoons of peanuts onto a baking tray and bake in the oven for about 5 – 7 minutes or until golden brown. Remove from the oven and allow to cool then chop into pieces. To serve spoon the dip into a serving bowl and sprinkle the roasted peanuts over the top. Serve this dip at room temperature with some crackers. If you don’t have fresh chili you can use chili sauce or bottled chili.